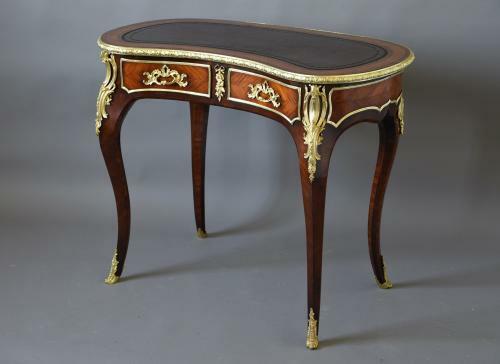 This desk consists of a tooled brown leather kidney shaped top with Kingwood bandings of varying size with a shaped ormolu moulding to the edge. This leads down to two drawers to the front, each being quarter veneered in Kingwood with a fine quality ormolu handle to the centre each with an English lock, each drawer having a shaped ormolu moulding with a floral ormolu mount to the centre of the two drawers leading round to the side panels also quarter veneered and having shaped ormolu mouldings. This leads down to the four cabriole legs, having a large foliate ormolu mount to the top of each leg and terminating with an ormolu mount to each foot. To the back of the desk the drawer design is replicated with two dummy drawers of identical design to the front and so making this elegant piece a freestanding desk. Although there is no evidence of a makers stamp on this desk it was undoubtedly made by a very fine cabinetmaker due to the fine quality workmanship, possibly by a maker such as Edwards & Roberts. The locks on the drawers are English and the drawers have dovetails and due to this we feel this is an English piece made in the French style. This desk in in excellent condition, is of stable construction and can go straight into a home, office or even bedroom.